• Yard Sale:8:00 a.m. to 1:00 p.m.
• Block Party:10:00 a.m. to 1:00 p.m. Setup times: Setup times will be between 7:00-8:00am. Please do not arrive any earlier. Vehicles may be used to unload in front of the library until 7:30am at which time all vehicles must be moved to the designated parking area. Reservations: If you have a reserved spot and are unable to attend, you may transfer your spot to another person. In the event of a transfer the library will need to be notified by Saturday, August 12, 2017 of the change. No cancellations will be accepted and no refunds will be issued. Reserved spots will be held until 7:30am, at which time they may be reassigned to a walk-in customer. The library will provide the tables and a space of yard. Sales: No selling of food, snacks, drinks, alcohol, fireworks, guns, knives, weapons, pornographic material, illegal merchandise, or counterfeit items will be tolerated. Parking: During the yard sale, all vehicles should be parked on Reading Blvd. between Franklin St. & Wayne Ave. Please honor all traffic cones and “No Parking” signs. Clean-up: Please remove all trash from your space prior to vacating the block party. Cancellations: There is no rain date for the block party or yard sale. 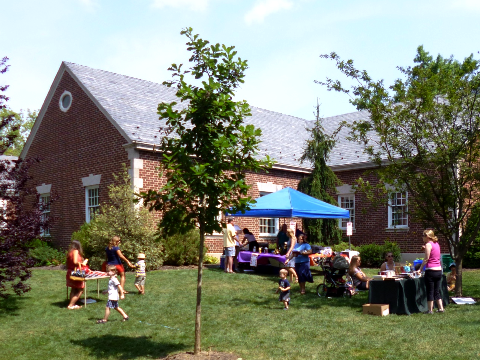 Cancellations will be posted on the Wyomissing Public Library’s website and Facebook page. No Smoking: Smoking is prohibited on library grounds, including the yard sale location. 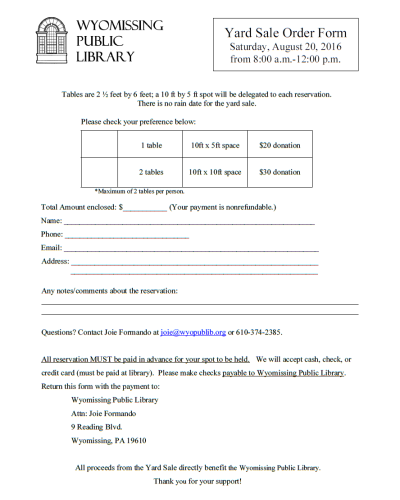 If you have any questions, please contact Colleen Stamm at colleen@wyopublib.org or call the Library at 610-374-2385.